March 2017: The websites pushsignals.net, binaryoptionsrecovery.com, binarytab2.com, forexmirrors.com, and etsysalesengine.com are all under the same ownership. The owner has left multiple fake positive reviews at the FPA to promote his companies. One of the best Binary Options Signal service, it's 100% free for all, no need to register or buy anything it's free. Must try it really good Signals. Another fake 5 star review spammed from this person. Hi, i have lost $19K by trading on Cherry trade Scam broker on Binary Options, I was depressed and got this website contact through a friend, I have contacted them and these guys recovered $14K by using their legal services, anyone who got scammed by Binary Option brokers or lost their Money i must say try these people, very professional approach. First, he spammed twice for pushsignals.net. Now he's spamming for binaryoptionsrecovery.com. The FPA believes that binary options recovery is very likely designed to steal more money from scam victims. I have tested this service last 3 weeks, Actually last week performance was not so good but Average but First 2 weeks was so great, more over they do not charge anything as per they say and also 24/7 provides free advice on anything or any signal and strategy which is great I must say. Over all 3 weeks performance as per said. 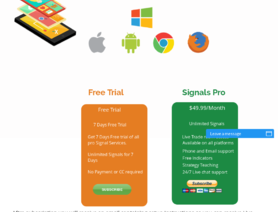 I have first heard about this Signal service through one of my friend who trading Forex since 5 years, i went to their web and they have provided me 1 week trial and excellent signals almost 90% Win ratio, I am the one ask Forex Peace Army to review this service as they are legit and with good performance. Also these people provide Signals delivery to Cellphone, PC and many other ways with strategy teaching and personal guidance if anyone need to learn something. This review came from the same location used by PushSignals.net to register and FPA Forums Account.